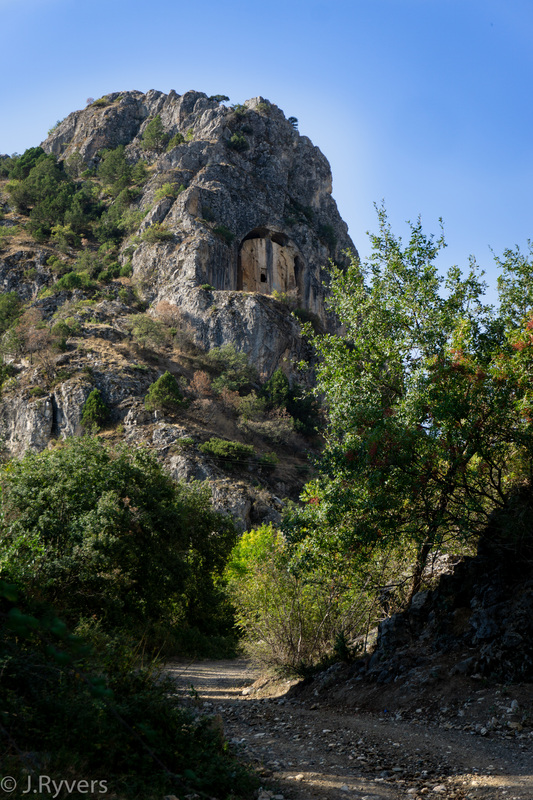 A short drive north from the city centre of Çorum, set among the green mountain valleys is the monumental tomb of Kapılıkaya (meaning rock with a door) dating from the Hellenistic period (2nd century BC). Very little seems to be known about the site, and every source I could find online had a cut-and-paste identical article complete with the same mistranslations. 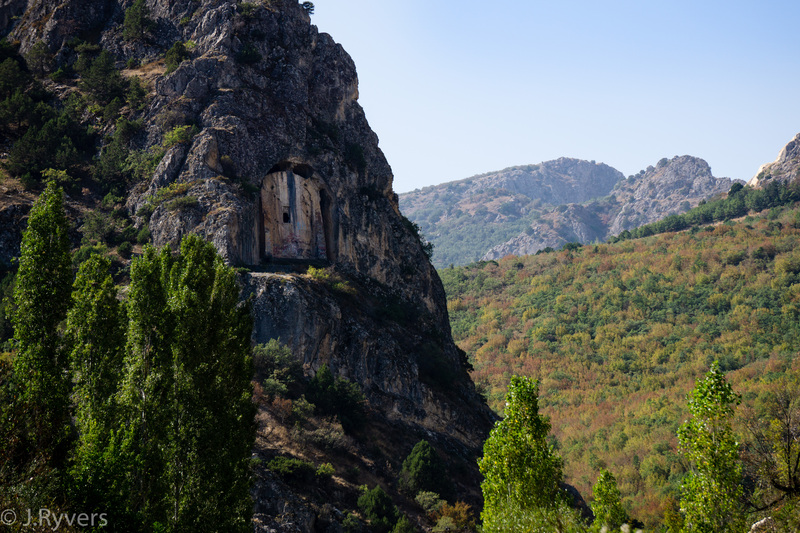 The tomb is cut into an arm of a mountain reaching into a valley just south of the town of Laçın with a creek running below. A platform with stairs leading to the tomb itself is directly in front of the tomb but as it is surrounded by cliffs, there is no easy access to the platform today if there ever was one. A steep trail winds up to the left of the tomb allowing visitors to reach the tomb. The tomb is not simply a door shaped façade but is actually a roughly cube shaped building cut out of the mountain with just a few points left where the tomb is still attached to the natural rock around it; probably to keep the ceiling from collapsing. You can actually walk all the way around the tomb or climb onto the roof. At the back of the tomb people have been breaking rock and cutting into the centre of the massive cube likely looking for treasure as this is rather common in Turkey. The actual grave part of the tomb is reached by a little opening high up in the face of it. An inscription above the entrance reads “IKEZIOS” though no more seems to be known about who this was. At the moment you’ll have to be creative if you want to get into the grave as the rope that was hung from above has broken. 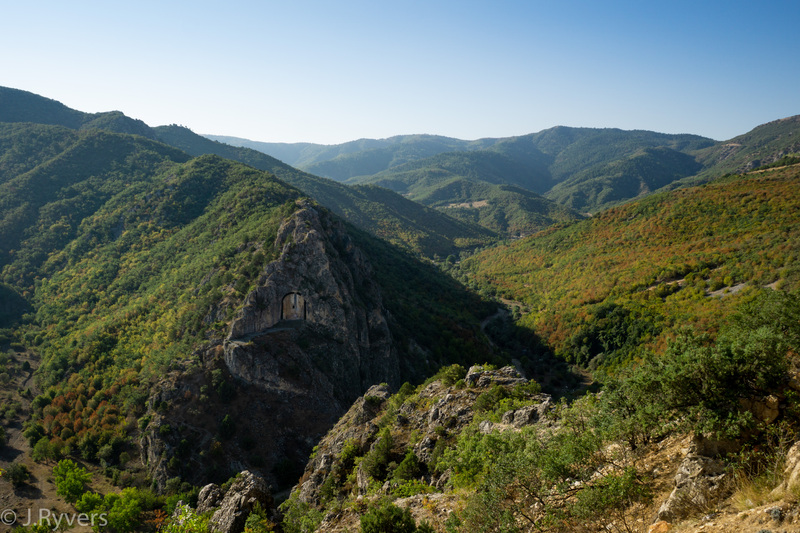 You’ll definitely want to view Kapılıkaya from far above along the highway and see the amazing structure nestled among the forested folds of the mountains and valleys! Other than a private car there is no other good way to reach Kapılıkaya that we are aware of. If you’re coming from Çorum city centre then Kapılıkaya is only 27 kms north along the Çorum-Laçin road (sometimes referred to as the Çorum-Osmancık road). The viewpoint is from a large pull-out in a sharp bend in the road with the mountainside to your left and the valley below to your right. From there you’ll head onward, taking your first right followed by another right down increasingly narrow and bumpy roads to the base of the site. 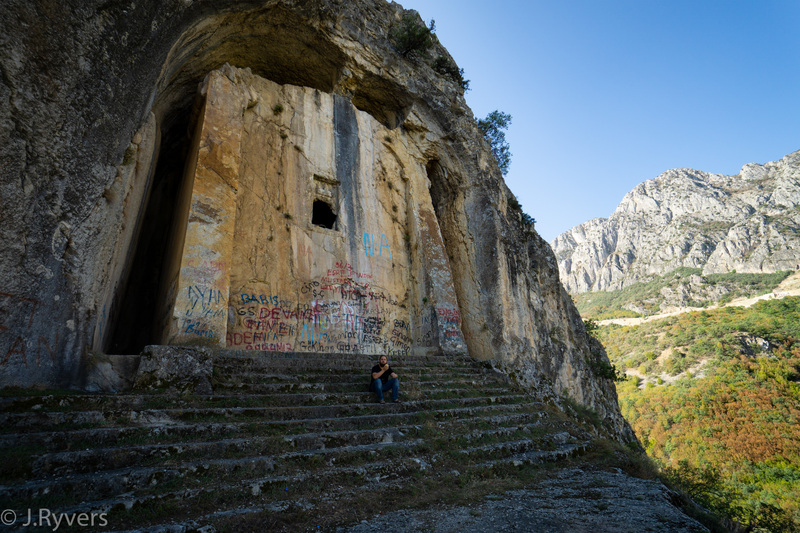 While it is certainly possibly to hike here, it is not a part of the Hittite Way network of marked hiking trails. As Kapılıkaya is so close to the Çorum city centre we would recommend you stay there as it has the most options for transit, accommodation, and food. Planning on visiting Kapılıkaya? Make sure to check out what other sights are in the area!